Pick just the right girlfriend birthday wishes in two easy steps. 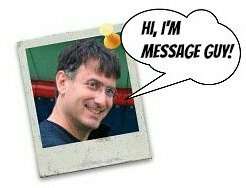 First, read Message Guy Tip #67 below to get a better idea of how to choose the best birthday message. Second, choose a winner from pages of girlfriend-approved birthday messages, starting right below. What's a winner? 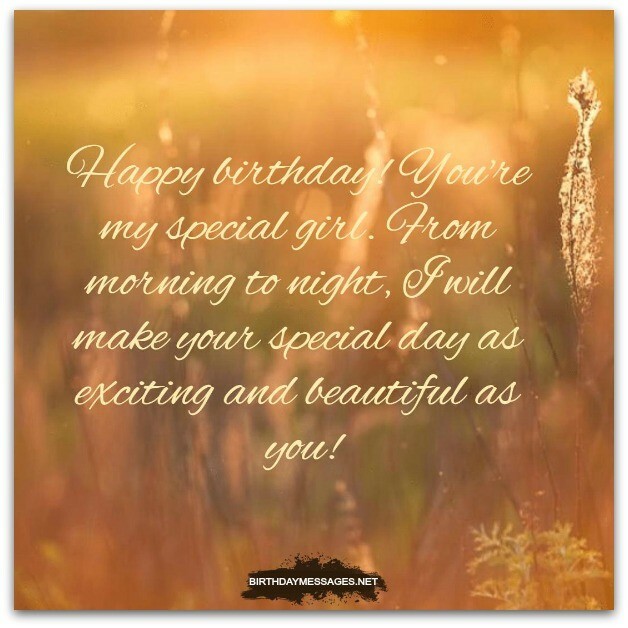 It's a birthday message that says everything you want to say to your girlfriend — nothing less. Yes, it's that easy. It would be easy for me to just tell you to make your girlfriend birthday greeting romantic. That's a pretty obvious route to take. 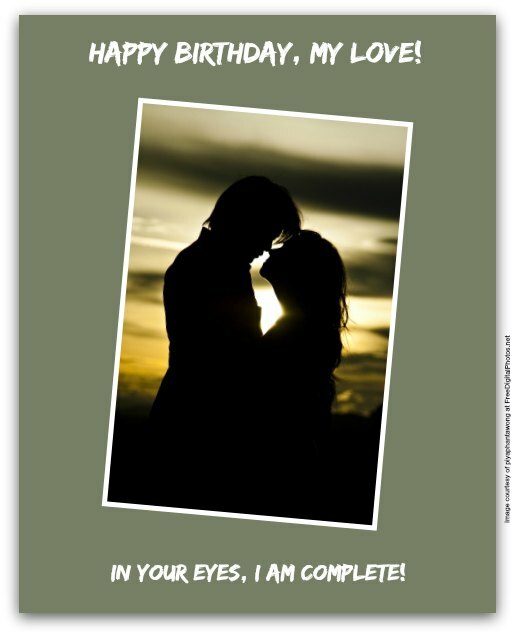 What's not so obvious is the level of romance you should inject into your birthday message for her. So how should you proceed? You should consider how far you want to go with your message. If you're too aggressively romantic with your choice of girlfriend birthday wishes (and you try to sweep her off her feet with hugs, kisses and empty, sweet words), you'll end up tripping over yourself and falling flat on your face. Of course, if you're not romantic enough, you'll come off as too cold and instantly send your girlfriend into "OMG-he-doesn't-love-me-anymore" panic mode. The right route to take is also the safest and the most honest: pick girlfriend birthday wishes that reflect how you feel about your girlfriend and the level of romance in your relationship. Nothing more, nothing less. In practical terms, if the romance in your relationship is, on a scale from 1 to 10 (with 1 the lowest level of romance and 10 the highest) 6 or lower, don't overdo the romance. In fact, you should take the sentimental path. It's easy — simply click here to go to my Sentimental Birthday Wishes section. Yep, it's that easy! If the romance in your relationship is, on the same scale, 7 or higher, be as romantic as you want. For you, I have all sorts of romantic messages in this section. So how romantic are you and your girlfriend? Take the "Which Disney couple is your ideal relationship?" quiz right now to find out and, once you have your answer, start browsing through my girlfriend birthday wishes for the right one. Happy birthday! You're my special girl. From morning to night, I will make your special day as exciting and beautiful as you! On your special day, sweetie, I just would like you to know you're the only girl I will ever love in my life! Have a wonderful birthday! 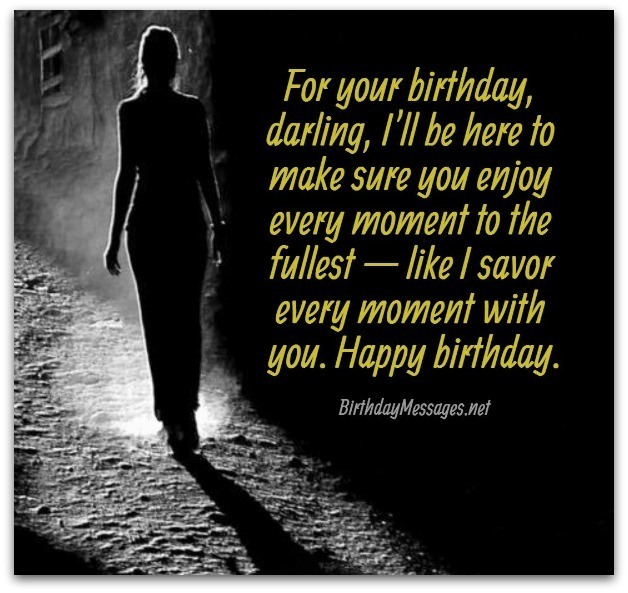 For your birthday, darling, I'll be here to make sure you enjoy every moment to the fullest — like I savor every moment with you. Happy birthday. Happy birthday to the world's brightest, prettiest, funniest and smartest girl. That's you, sweetheart, today and forever. For me, every day is special when I'm with you, but nothing is more special to me than the day you were born...and your every birthday ever since. Happy birthday! I promise to make this birthday the loveliest and sweetest you've ever had! I love you more and more with each single one! Happy birthday. Happy birthday! Your special day is joyously, incredibly, awesomely and wonderfully special to me because you're joyously, incredibly, awesomely and wonderfully THE most special person in my life. I must have been an amazing person in another life because I found an amazing girlfriend like you in this life. I'm so in love with you! Happy birthday! Happy birthday! I love your eyes. I love your smile. I love your neck. I love your hands. I love your nose. I love...everything about you. You’re why I have so much love in my heart. When I'm not with you, I just shut my eyes and, like magic, everything I adore about you, pops into my head, making me feel like you're with me. So, even though I can't be with you on your special day, just shut your eyes and right beside you will be me. Happy birthday! You're so special that the world should know to stop turning for 24 hours, so everyone can celebrate the special day of its most special citizen: you wonderful you! Have a special birthday, my love! 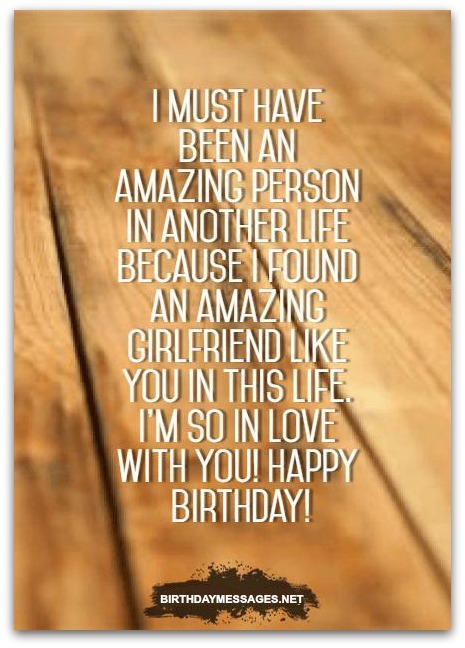 Below are three terrific romantic birthday wishes for your girlfriend because each one is a birthday message that shows just how much you love your girlfriend, without actually spelling it out, which is not as appealing as showing it. That's why the birthday wishes below are my favorite. I think they will be your girlfriend's favorites too. When I wake up, you're my first thought. When I'm just about to fall asleep, I think about you one last time. 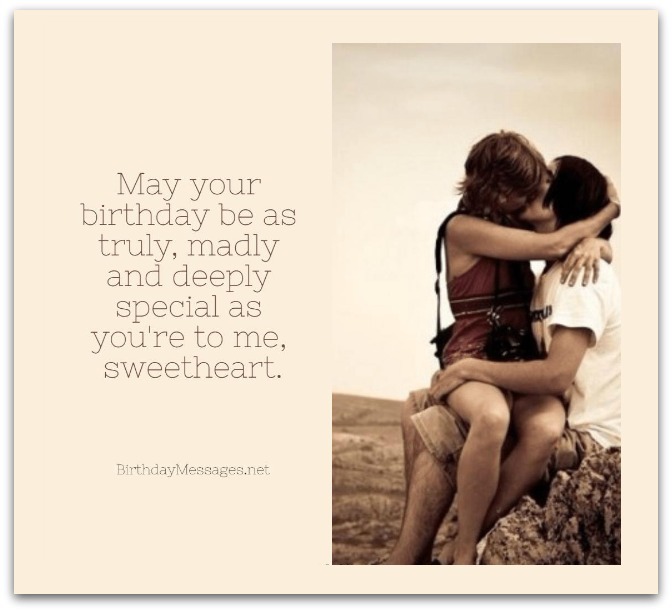 You're in my thoughts 24/7, doubly so on your special day. Happy birthday, darling. For me, your special day should be celebrated with a star-studded affair. Your name should be up in lights. Paul McCartney should sing "Birthday" to you. That's how special you are! Have a wonderful birthday! I love you! Happy birthday! "I love you" doesn't even come close to how deeply I've fallen for you, so I will give you one birthday hug for every second I'm with you on your special day. I don't think we're going to get much done today. Once a year is a day so special that the other 364 days of the year pale in comparison. Once a year is your birthday. This year, I will make your birthday so special that you will remember it forever...or until the next birthday we celebrate together! Honey, you rock my world more than the heaviest metal band, more than anybody else ever could. Now I'm here to return the favor. Let's make your birthday rock all night long! I love you. If I added up every precious moment we've spent together, it would be worth more than all the gold in Fort Knox. My time with you is priceless. I've hit the jackpot with our love. Happy birthday to my little treasure. I love you so much that I booked every room of your favorite hotel for your birthday, for the entire night, for just the two of us. In other words, I kicked out my roommate and we have my entire apartment to ourselves. Get ready for a five-star birthday! Wishing you a “Happy Birthday” is not the only way I can show you my love. Let’s get into our birthday suits and express ourselves! Happy birthday, lover! Wishing the best of everything because you’re the best. I love you. Happy birthday, sweetie! You're my girl, my love, my life. I'm going to make every second of your birthday the time of your life. Happy birthday, baby! Happy birthday, sweetheart. You can do no wrong! You're just right for me. For your special day, I'm going to give you all the love I have. Most of the time, it's hard for me to show how I feel about you. But it's your birthday and I want it to be special, so I will at least try to express my true feelings. Luckily, I found the perfect words...I love you!